Learn how to make healthy meals for you and your family without spending hours in the kitchen. You will learn how to make a main dish, appetizer, healthy desserts and snacks. 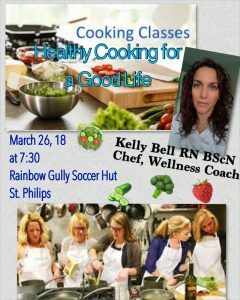 You will have hands on experience guided by Kelly a chef, nurse and wellness coach. Then sit down and enjoy your creations. Take home all of the recipes and healthy tips. Call Mike at 895-5671 to register. Register early as class size is limited. Second class scheduled for April 24th.